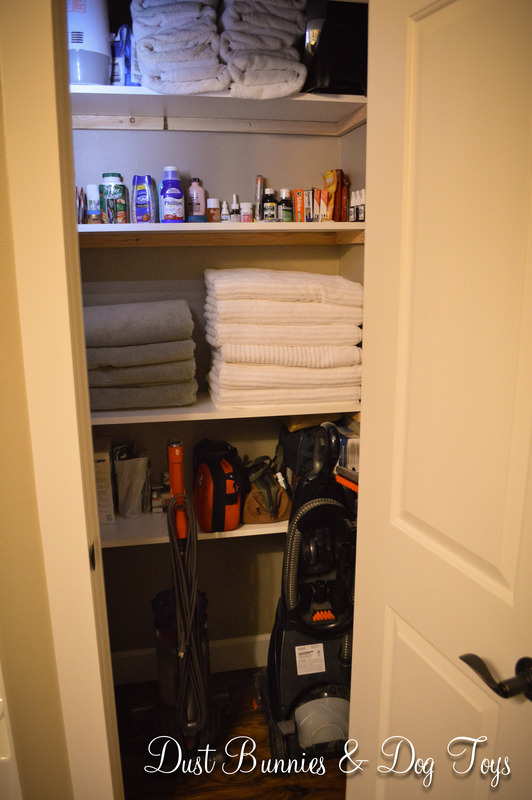 After finishing the Master closet storage system, the hubs installed the shelving in the hall bathroom closet and I quickly organized the contents of the last two boxes for that space. We decided that the steam cleaner, vacuum and other floor cleaning tools would live in this space so he installed the first shelf high enough to accommodate that. 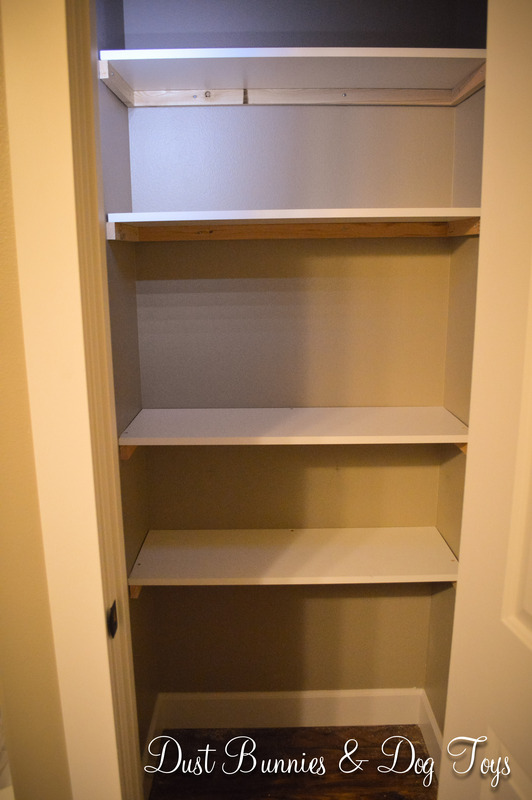 He continued the same shelving material and design as he did in the pantry. 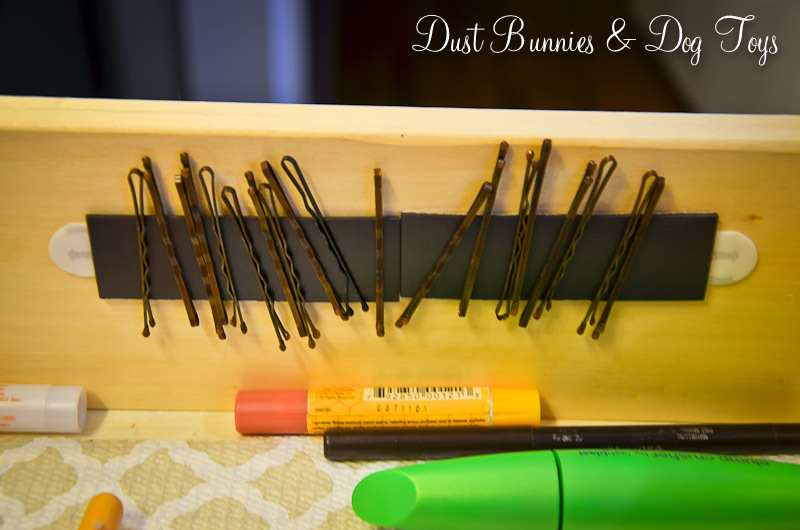 Because I didn’t need this space to do much beyond holding towels and toiletries I didn’t pre-plan the layout, which was frustrating for the hubs who wanted specific guidance on what I would like. We talked it through and hashed it out as we went and I think it turned out great. The top shelf holds those infrequently used items like the humidifier and fan along with the “dog towels” since the tub in this bathroom is where they would be bathed when they are do get a wash at home. The next shelf hold all those medications that seem to accumulate from nowhere. Next was spare towels, which I wanted within easy reach for guests and potential future human chitlins. The bottom shelf holds the first aid kits (both human and animal – because we’re that kind of household LOL) and bandages, along with the plethora of spare toothbrushes my dentist continues to send me home with even though he knows I have a Sonicare toothbrush. With a little arranging, everything fit really well. I might add a stair step organizer to the shelf with all the medications on it to make it function a little better, but for now it’s easily accessible and it fits. Because the space doesn’t have a dedicated light fixture, the ambient light from the vanity light is all there is. 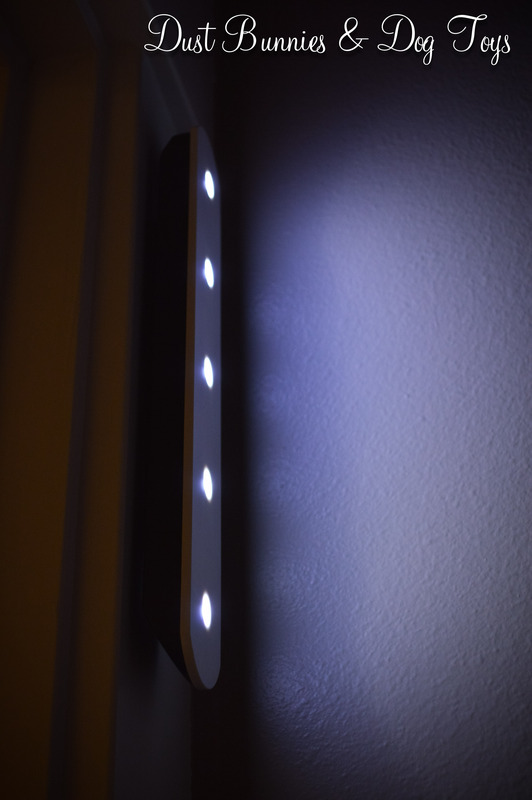 To alleviate this, the hubs also added a small LED light bar near the door for a little extra illumination when needed. I don’t think we’ll need it often, but when we do it will be nice to have at the ready. But what I like best about it is that it didn’t cost a dime, because we had it from a previous project that no longer needed it.